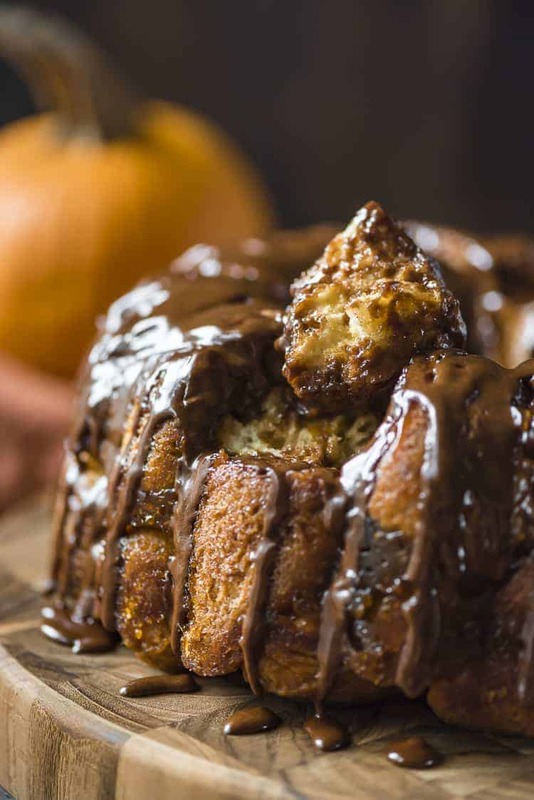 This indulgent Chocolate Rum Pumpkin Monkey Bread is nothing like your Mama makes! 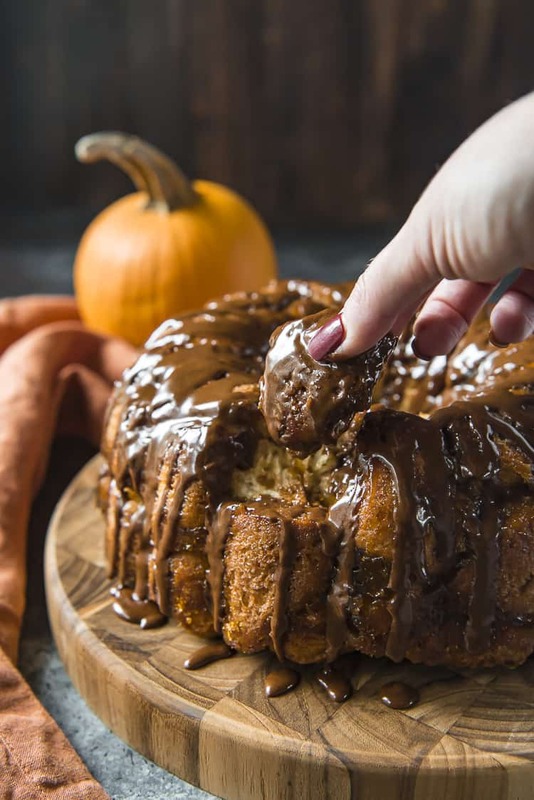 This decadent breakfast-dessert takes the standard pull-apart cinnamon biscuits up a notch with the addition of a gooey pumpkin-brown sugar syrup and boozy chocolate glaze. I’ve never met a monkey bread that I didn’t like. After all – what’s not to love about flaky biscuits doused in sugar and covered in gooey glaze? And this one is pure pumpkin-y heaven, and perfect for every year-end holiday. I can’t promise this will be my last pumpkin post of 2018 – but I will tell you that I’m about to move into apple and peppermint season. 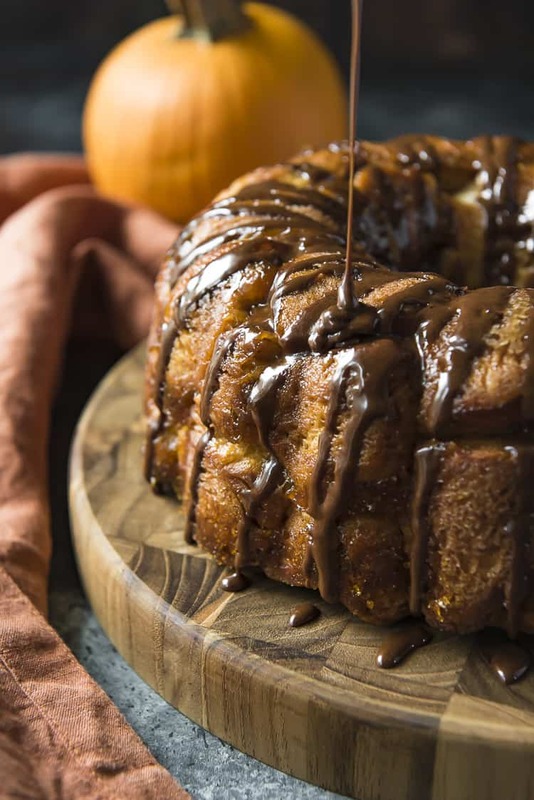 JUST TAKE ME TO THE PUMPKIN MONKEY BREAD ALREADY! 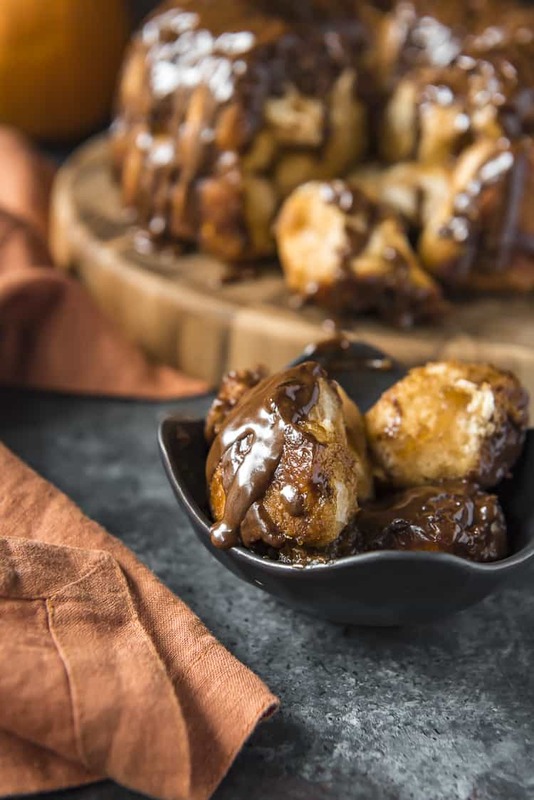 If you’d rather skip my (pretty darn helpful) tips and tricks, essential cooking info, and similar recipe ideas – and get straight to this deliciously easy monkey bread recipe, just scroll right on down to the bottom of the page where you can find the printable recipe card! So just like that, it’s Halloween night! Honestly WTF. Where did October go? How is it already November eve? I’m still waiting on some steady October weather to help my brain understand that we’re hurdling headlong into the holiday season. I have pumpkins and fall leaves all over my house. Fall candles have been burning since September. I’ve even pulled out my fall wardrobe. And it’s still not clicking. 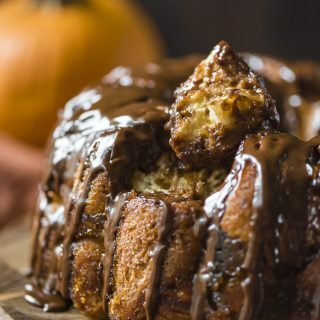 Hopefully, this yummy Chocolate Rum Pumpkin Monkey Bread helps! 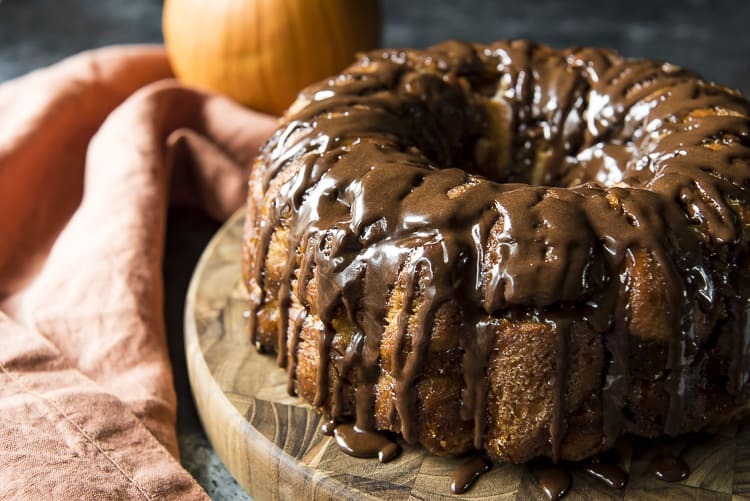 Monkey Bread is a cake or loaf made of soft cinnamon-infused dough bites. The dough is covered in a melted sugar and butter sauce before being baked and served hot. It is one of those easy, last minute treat recipes that are enjoyed by any and every age. Perfect for potlucks and parties, this dessert can often be found at festivals and county fairs, especially in the South. Similar to coffee cake, it originated in Hungary, known as arany galuska. The Americanized version originates from it’s very nature. As a finger food, you pick Monkey Bread apart, much like a monkey would. It is also known as sticky bread, puzzle bread, and pinch-me cake. 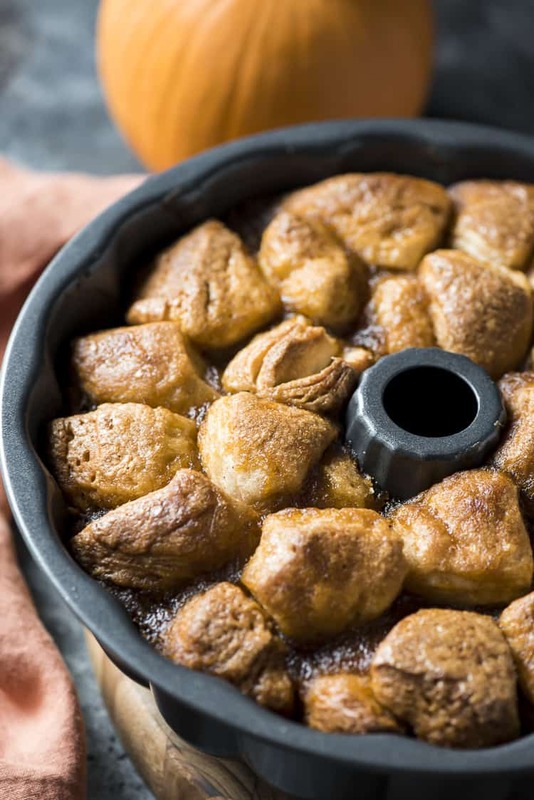 Which Biscuits Are Best For Pumpkin Monkey Bread? I used half flaky and half Southern-style in this recipe, and I loved both bites! My favorite was definitely flaky, however – the texture can’t be beat! Can You Make Monkey Bread In Advance? If you follow the recipe here as written and use refrigerated biscuit dough, I would recommend NOT making it the night before. Convenience breads like that use baking soda instead of yeast as a leavener and will not rise as well as yeast-based doughs after a night in the fridge. First, preheat your oven to 350 degrees. Generously grease a 12-cup bundt pan or large loaf pan with butter. Next, in a medium saucepan set over medium heat, melt butter, brown sugar, pumpkin puree, and rum. Whisk until well combined, then remove from heat to cool slightly. Then, in a large plastic zipper bag, combine sugar and pumpkin spice. Now, remove the refrigerated biscuits from their packaging. Cut them into quarters and place half of the pieces into the bag of spiced sugar. Shake well to coat the dough pieces. Place the batch into the prepared bundt pan. Pour half of the pumpkin syrup over the biscuit pieces. Repeat the process with the remaining dough and pumpkin syrup, creating a second layer. Place in oven and bake 35-40 minutes until biscuits are golden brown. Remove from oven and allow to rest in pan for 10 minutes, then invert on a serving plate. While monkey bread is baking, making chocolate rum glaze. Combine all in bowl and whisk well, adding more rum as desired to thin or thicken the icing. 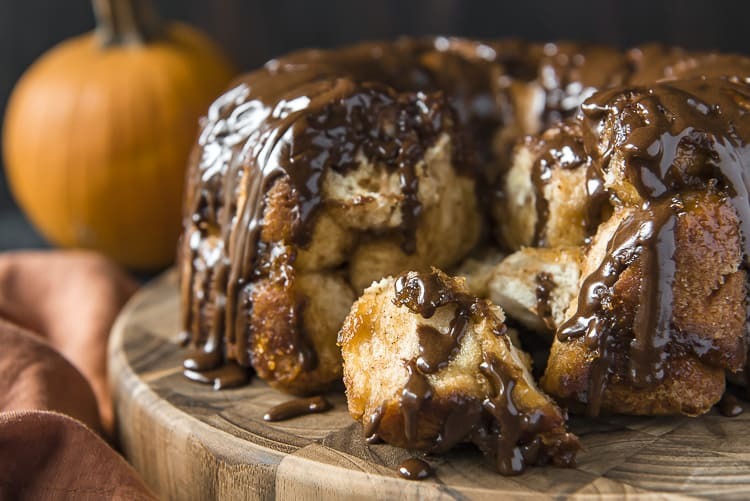 Drizzle glaze over warm monkey bread and serve. LOOKING FOR MORE SWEET BREAD RECIPES? Preheat oven to 350 degrees. Spray or butter a 12-cup bundt pan; set aside. Combine the granulated sugar and pumpkin spice in a large zipper bag; set aside. Remove biscuits from tubes and cut each one into quarters. Place biscuit pieces in the bag with the sugar mixture and shake well to coat. Set a small saucepan over medium heat and add brown sugar, butter, canned pumpkin, and rum (or vanilla). Cook, stirring occasionally, until sugar is melted and mixture is smooth. Place half of the coated biscuits into the prepared bundt pan. Drizzle half of the pumpkin mixture over them, then repeat with the remaining biscuits and the rest of the pumpkin mixture. Bake for 35-40 minutes, until biscuits are golden-brown and baked. Allow to cool in the pan for 10 minutes, then invert on a serving plate. Combine the powdered sugar, cocoa powder, rum, and vanilla in a medium bowl. Whisk well until smooth and combined, adding a bit of milk or water if thinning is needed. Drizzle over cooled monkey bread. 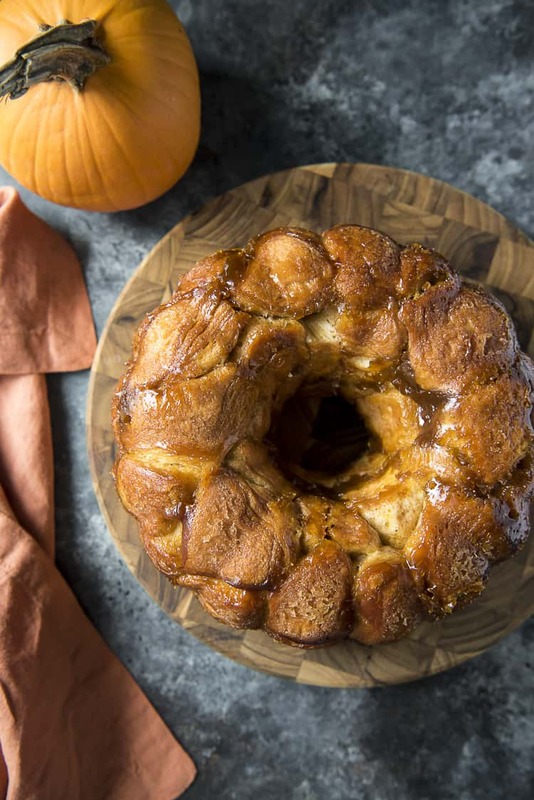 PIN THIS PUMPKIN MONKEY BREAD FOR LATER!